The Finns are believed to have originated from the Volga basin in Russia. They ousted the Lapps from Finland in the 7th century. Finland was conquered by Sweden in the 12th century, and remained under Swedish rule until 1809 when Russia conquered Sweden, and Finland was ceded to the Russians. It remained a grand duchy within the Russian empire until 1917, when it declared its independence. Although invaded by Russia and Germany during World War II, it managed to resist with minor concessions. It is a member of the EU, and is the only Nordic state to have joined the Euro. 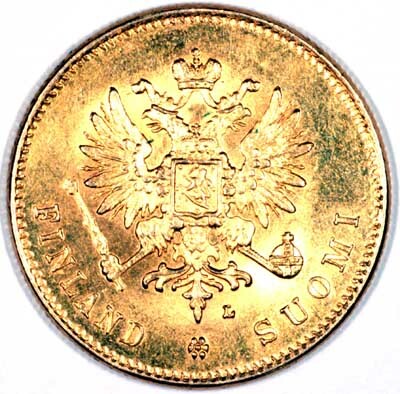 Finland, as can be imagined from its history, has only issued coins for a relatively short period of time, and very few gold coins indeed. 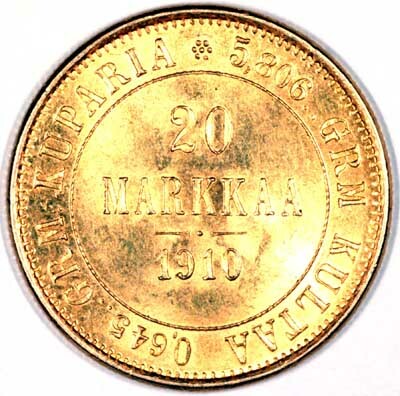 There were issues of gold 10 and 20 Markaa under Russian control from 1878 to 1913, the same denominations in 1926 as a republic, then nothing until the 1990's when a small number of commemorative coins have been issued. in two lines with date 1910 below. This translates as 5.806 grams of gold and 0.645 grams of copper. For silver and base metal coins of Finland, please look at our original Chard Coins website.